Vedams has a decade of experience in storage testing through use of standard tools and custom frameworks. QA and testing is very core to Vedams and focuses on end-to-end storage product testing so that our clients deliver reliable and robust products to their customers and OEM partners. Over the years, we have accumulated vast knowledge about storage QA testing processes as well as software testing tools. We have developed sophisticated test automation tools that can quickly be adapted to specific client needs. Our state-of-the-art lab boasts Tera bytes of storage available in SAN, NAS, and server-based storage. This combination allows us to instantly provide enterprise-class testing capabilities to any engineering department, shaving weeks and months off the time-to-market. 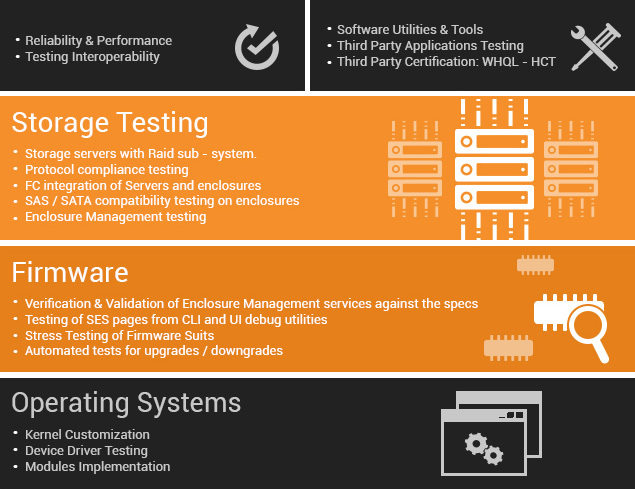 Whether the project calls for software testing tools or QA services for storage products, dedicated Vedams testing teams work very closely with the client’s development teams during the entire product life cycle to ensure product quality. During the design phase, when product requirements are being refined, Vedams engineers anticipate and point out quality bottlenecks and contribute to design improvements so that the path from functional testing to certification is navigated with ease. Client engineering teams can focus on the product functionality rather than worry about building complex test cases/scenarios and their execution. During development, daily regressions, test tool development, and test development proceeds in parallel with the development of the product. During final testing, product certifications are conducted before the product is released. After release, Vedams often takes over sustaining work. This allows the client’s internal engineering to focus on next generation products and bring new products to market faster. Vedams does not stop at manual testing. As processes become well understood, the team innovates around the testing area and uses engineering smarts to convert the process in to an automated tool. A combination of third party and internally developed test automation tools are leveraged to develop a customized automation strategy that helps in improving efficiency and reducing time to market for our clients and their partners. Automated tools, which are adapted for a particular client, lead to increased quality, improved productivity, and rapid testing. Internal elements like thermal sensors, PSUs, Drive Power Controls, etc. VPD, SES, OPS Panel, Firmware Upgrade/Downgrade, etc. Automated tests for continuous I/O, repeated power cycle, HBA resets, Host reboots, etc.